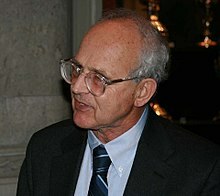 Rainer "Rai" Weiss (/waɪs/; German: [vaɪs]; born September 29, 1932) is a German-born American physicist of partly Jewish descent (his father was Jewish). He is known for his works in gravitational physics and astrophysics. He is a professor of physics emeritus at MIT. He is best known for inventing the laser interferometric technique which is the basic operation of LIGO. Weiss was Chair of the COBE Science Working Group. In 2017, Weiss was awarded the Nobel Prize in Physics, along with Kip Thorne and Barry Barish, "for decisive contributions to the LIGO detector and the observation of gravitational waves". ↑ Lars Brink (2 June 2014). Nobel Lectures in Physics (2006 – 2010). World Scientific. pp. 25–. ISBN 978-981-4612-70-8. ↑ "NASA and COBE Scientists Win Top Cosmology Prize". NASA. 2006. Retrieved 22 February 2016. ↑ Weiss, Rainer (1980). "Measurements of the Cosmic Background Radiation". Annu. Rev. Astron. Astrophys. 18: 489–535. doi:10.1146/annurev.aa.18.090180.002421. http://ned.ipac.caltech.edu/level5/March03/Weiss/Weiss5.html. This page was last changed on 20 June 2018, at 02:38.